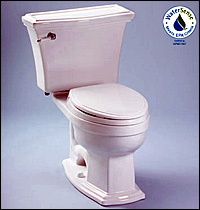 Using toilets with High-Efficiency Toilets (HETs) can save up to 22,000 gallons of water a year. Don’t use your toilet as trashcan, this only inhibits efficiency and uses more water. Cutting a minute off your shower every day will save more than 900 gallons of water annually (based on a taking a seven minute shower). Purchasing WaterSense labeled 1.75 gpm showerheads can save your more than 7,500 gallons of water annually. Using efficient faucets and installing low-flow aerators on kitchen and bath faucets will save hundreds of gallons of water each month without requiring any additional effort. Use the appropriate water level and load size when doing laundry in your washing machine. For the most savings, purchase a frontload washing machine. Water your garden or grass in the morning when it’s coolest, and avoid watering on windy days. Landscape with low-water plants to significantly reduce water usage outside the home. Use leftover drinking water for houseplants, instead of pouring it down the drain. Make sure the dishwasher is fully loaded, and use the energy-saving dry option, if available. Always purchase ENERGY STAR® labeled appliances when it comes to your washer and dishwasher because they typically use 50% less water and electricity and are much more efficient.